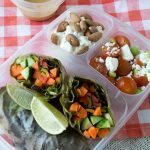 This is the first in a series for healthy lunchbox recipes, starting with Vegetable Spring rolls and a lightened up Peanut Sauce! It’s summer and that means it’s time for summer beach days, picnics, playgrounds or day camp for the kids. 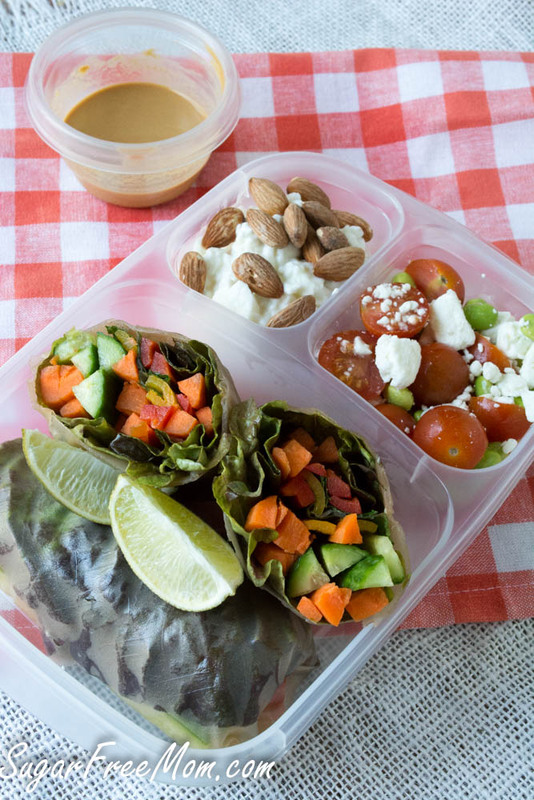 Packing a healthy lunch doesn’t have to be difficult and can definitely be delicious. Speaking of day camp, this week starting today, my 3 kiddies and I will be at cubscout day camp every day, all day, rain or shine! My youngest just loves it, but I’ve been volunteering since he was just a tot and couldn’t even join in as his older brother was the cubscout. My daughter was also able to be in the sibling group since I was volunteering and she loves it as well. I can’t say it’s been easy, but I do believe it’s making memories for my family and that’s why I do it. Many times I’d just rather drop them off, especially if the weather isn’t looking great, but I continue to do it, because as my youngest would say, “It just wouldn’t be the same without you there momma”. And so today is our first day. It looks like rain is coming from the dark grey sky’s I can see outside my office window as I type. The leaves on the trees are swaying side to side with a jiggle from the wind that’s picked up speed, like they’re giggling at me. Such is life……. I have a poncho and a fantastic lunch! For me, lunch can be monotonous. And that bothers me. While day camping with all these little cubscouts in my den, I want a hearty lunch to hold me over till I can get home after 4pm. It’s easy to get into a foodie rut. Sometimes it’s just easier to stick with the same lunch you’ve been having because 1. you know you like it and 2. it’s automatic. No need to have to get new foods you may not have on hand. 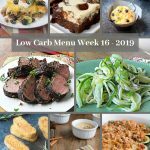 BUT the problem with being in a foodie rut is that often, even though you might certainly love that particular same old lunch, you get bored. Boredom for me leads to overeating because I’m not satisfied. Making these little spring rolls doesn’t require much more than being prepared with your cut veggies and soaking your rice wrapper in warm water to soften it. It does take a little practice to roll these but if it breaks, just start a new one and all will be well or add an additional one to the broken roll. It will cover it up just fine. No one will notice and your lunch will look like a professional made it or you bought it at Whole Foods! You can change out the veggies to whatever you like. 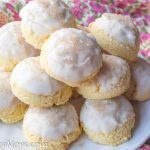 I love crunch and you will certainly be crunching on these rolls. 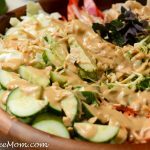 But the peanut sauce is what makes them so fantastic! I chose a powdered peanut butter, but if you don’t have one you can use regular peanut butter. Just note that will increase your nutritional info. I added some sides and there you go. A healthy hearty lunch filled with fresh veggies and protein, completely filling, and satisfying. Cubscout day camp here I come! 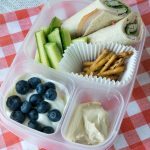 The lunchbox system I’m using is from easylunchboxes.com. BPA free and also comes with a cute little cooler bag as well. The smallest side compartment has 1/2 cup of low fat cottage cheese with 1 tablespoon of toasted almonds. The second side compartment has 1/4 cup sliced cherry tomatoes with 1/4 cup edamame and 2 tablespoons of feta cheese. 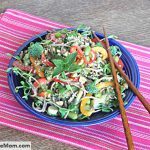 The optional lime wedges are to squirt over the tomato, feta, edamame side dish. The powdered peanut butter that I use contains only a small amount of coconut sugar, the brand is called Just Great Stuff. I found it at Whole Foods. Here’s my video all about it. Have all your veggies cut and ready to go in your wrapper. 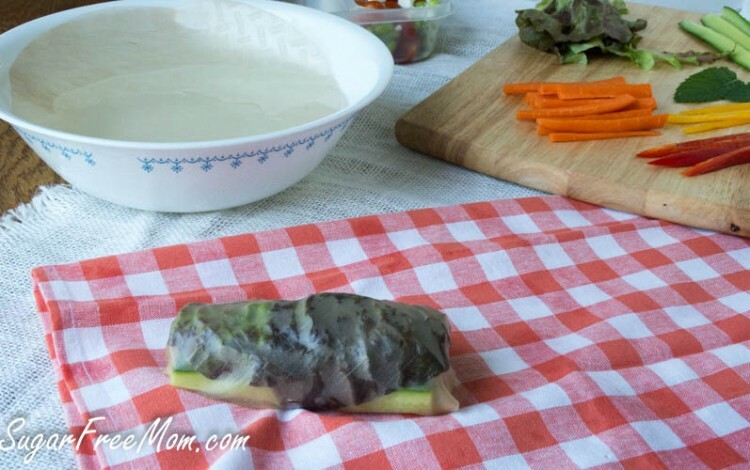 If you are making this to enjoy the next day at the beach, use 2 rice wrappers for each spring roll. But if making this to enjoy within a few hours, you just need one. Nutrition information below includes the sauce with the rolls. Lay a clean dish towel down on your work surface to lay the rice wrapper once softened. In a large bowl wide enough to not crack or break the rice wrapper, fill it with warm water and place one wrapper into the water. Let it sit for a few seconds, once you see it softened a bit, flip it over and let it sit for a few more seconds. Once it looks soft and pliable, gently lift it out of the water and place directly onto the clean towel. Lay 2 pieces of lettuce, 1/2 cup of carrots sticks. 1/2 of the sweet peppers, 1/2 of the cucumber sticks and 2 pieces of fresh mint if desired. Fold over lengthwise then fold up each side and roll over until sealed. Let it sit while you soften another wrapper in the warm water. 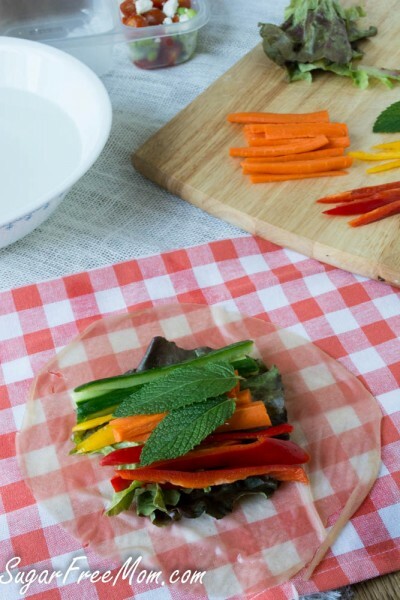 Roll up sides and ends and do the same procedure to make a second spring roll. 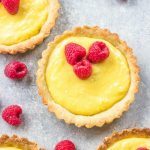 Slice in half and enjoy immediately or refrigerate until ready to serve. Mix the sauce ingredients together and keep refrigerated until ready to serve. Stir the sauce ingredients well before pouring over the halved spring rolls. oh man, look at all those gorgeous veggies packed in there. That looks like an amazing lunch idea! Oh YUM! This is my kind of box lunch. 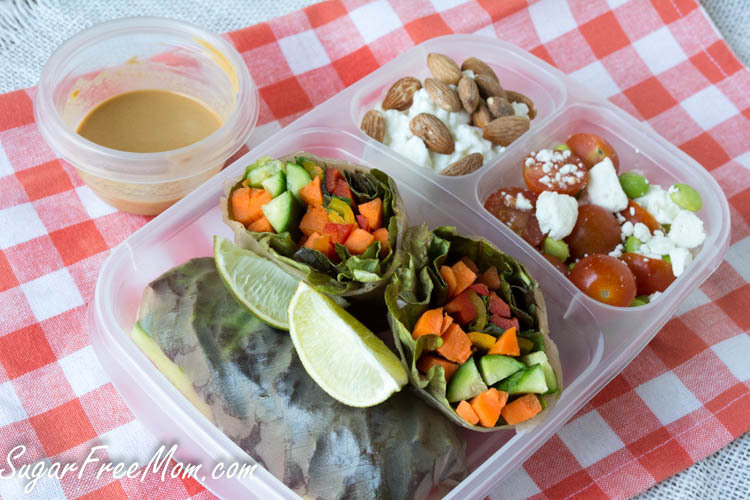 I’d happily eat veggie spring rolls and peanut butter sauce daily! Me too! But I’d love someone else to make them for me lol! What a healthy lunch box! I need to start packing more lunches like this. This looks like my favorite recipe in the world! 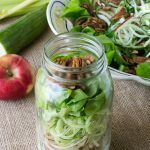 I love this lunch idea! And I love all those veggies! It looks delicious! I too have a history with the cub scout camping. Both my younger brothers were in it and I spent many a weekend at their campsites! Lots of fun, lots of work lol! These spring rolls look amazing! Love that they are healthier! Very filling, you will love it! How great would these be for a picnic! Those spring rolls look great! All those crunchy vegetables! I hear you on the lunchtime rut. I think I’m getting there, time for a change up. I never would have thought to pack these in a lunch before!! 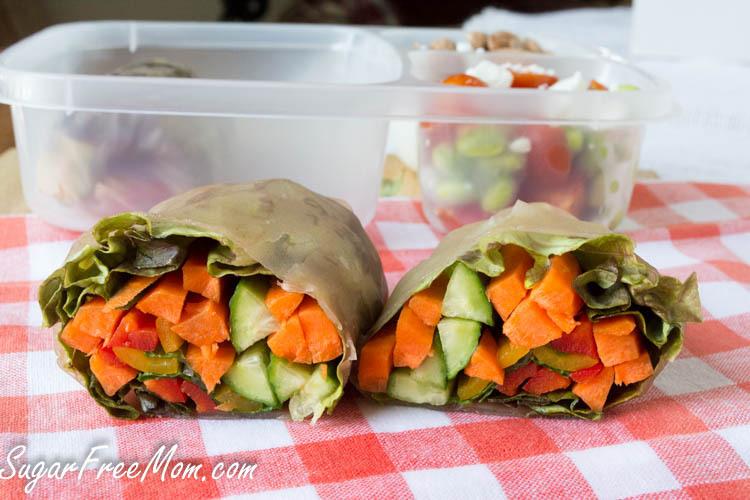 Such a fun idea and change from a plain ol’ sandwich! We just moved to a new neighborhood that has a private beach so we’ve been really beaching it up a lot this summer. 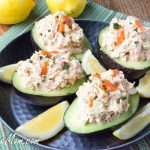 This would make a perfect picnic lunch for those hot days! I love spring rolls and haven’t made them in far too long. 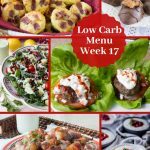 You just inspired me to add them to my menu for next week. Love the colors of all the veggies. 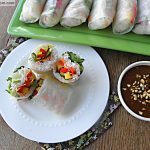 I’ve never made spring rolls, but these look great! I love creating memories with my kids, even though at times I just want to sleeeeeep! Love these spring rolls. So packed with veggies! I must be living under a rock, because I’ve never heard of powdered peanut butter. I must seek it out! I love making spring rolls at home. So simple and fresh. Such a great idea for a lunchbox!